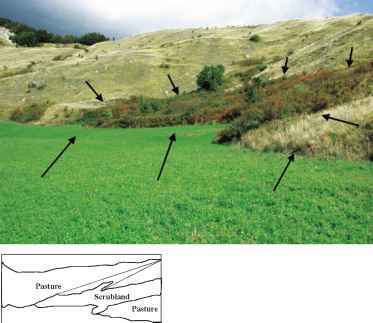 Shape, size, and spatial arrangement of patches composing a geographical landscape have an effect on the ecology of organisms, populations, and communities, as extensively described (Klink et al. 2002, Wu and Hobbs 2002, Farina 2006 for a review), but the mechanisms by which organisms use such patterns to identify specific resources like food, roosting, or mating sites remain largely obscure. For instance, spatial and structural attributes of a landscape like perforation, dissection, fragmentation (sensu stricto), shrinkage, and attrition produced by logging, ranching, or urban development inside forest areas (Bogaert et al. 2004, Levey et al. 2005) affect distribution, abundance, and behavior of organisms, and it becomes relevant to investigate the mechanisms that link such patterns with the habits of organisms (Farina 2008). In order to fill this epistemological gap, we have introduced the hypothesis that landscape is not only a geographical and ecological space but an agent that functions like a semiotic interface between resources and organism's needs. And according to this perspective, most of the principles on which the landscape ecology is based (Risser et al. 1984, Turner et al. 2001) become insufficient for understanding the ecology of organisms in space. Contemporarily, cognitive ecology has produced a lot of theoretical disputes, field observations, and experimental evidence (Garling and Evans 1991, Real 1993, Bennett 1996, Allen and Bekoff 1997, Dukas 1998, Nuallain 2000, Chittka and Thompson 2001, Shettleworth 2001, Grubb 2003), but, again, for a better understanding of the mechanisms by which cognitive processes intercept the recognized objects, it is necessary to use the fundaments of sign theory (Peirce 1955, Eco 1975) and their extension to the biological domain (Kull 1998a, Noth 1998, Barbieri 2003, Hoffmeyer 2005, Noth 2005, Favareau 2006, Barbieri 2008, Favareu 2008, Hoffmeyer 2008, Kull et al. 2008). Recently Kull et al. (2008) discussed the necessity to introduce a bio-semiotic approach to the study of the living systems. In particular they individualized important compartments of biology in which the bio-semiotic approach is important like animal communication, bio-semiotic processes in ecosystems (plant-pollinator interaction), the immune system, and neurosemiotics, etc. In particular, the eco-semiotic framework, defined by Noth (1998) as the semiotics paradigm transferred into the ecological domain, could help us to understand the mechanisms by which species connect their autopoietic characteristics to the environmental context of the geographical landscape. Every organism receives signals from the external nature (Hoffmeyer 1996) and at the same time maintains a homeostatic internal "quasi" equilibrium by autopoietic processes (sensu, Maturana and Varela 1980) that activate a certain level of internal insulation. Probably, two different mechanisms have to be invoked to explain the ecology of the species: an involuntary environmental constraint and a selected voluntary cognitive action. In the first case according to the individually based perceptional landscape (Farina et al. 2005) the spatial arrangement of the landscape mosaic, like woodland, fields and urban areas, affect organisms without the mediation of explicit cognitive mechanisms. This process is the result of all information (sensu, Stonier 1990,1996) that an organism intercepts from the surrounding world without a cognitive explicit elaboration. The environmental constraints (e.g. temperature, humidity, air turbulence, noise, water deficit, food availability) operate directly on the physiology or indirectly by exposing organisms to a modified probability of "fitness performance" (e.g. increased predation or starvation risk). In the second case, organisms perceive physical gradients from their surroundings and convert them into signs by a semiotic (cognitive) process that incorporates meaningful information (sensu, Menant 2003) inside its inner domain, while the surrounding context is transformed into its "private universe" or Umwelt (sensu, von Uexkull 1982 (1940)). Often the interactions between organisms are so specific that they can be considered semethic interactions (from the Greek semeion = sign + ethos = habit) defined by Hoffmeyer (2008) as: "Whenever a regular behavior or habit of an individual or species is interpreted as a sign by some other individuals (conspecific or alter-specific) and is reacted upon through the release of yet other regular behaviors or habits, we have a case of semethic interactions." With the increase of their cognitive mechanisms, organisms transform themselves from "objects into subjects of intentionality," and a growing asymmetry in information exchange appears. Specific details of the surrounding world become consistent with the IBCL hypothesis (Farina et al. 2005) that represents the elaboration of the perceived elements through experience, learning, and culture.